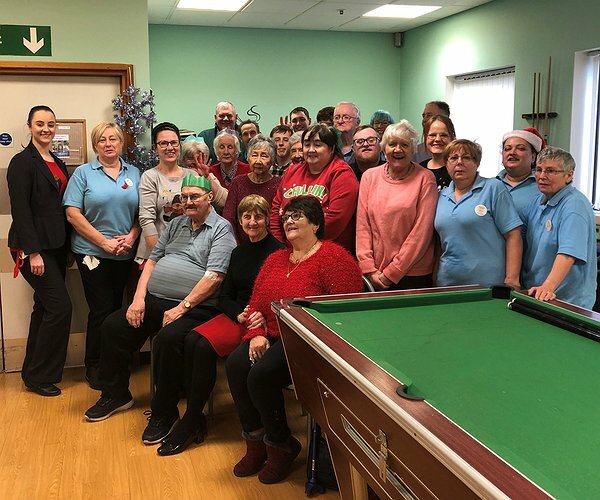 Local residents and volunteers who help out in the community were treated to a Christmas lunch and party at the Tesco store in Mold last week. Many of the residents came from the Nant Mawr Court sheltered housing scheme for older people, managed by Clwyd Alyn Housing Association in Buckley. They were joined by local volunteers who help out in Mold and the surrounding area. “Claire Parry, Tesco’s wonderful Community Champion, was a brilliant host. Our residents really look forward to this event which makes Christmas a really special time,” said Louise Blackwell, Community Development Officer with Clwyd Alyn. “It is events like this that make a big difference in terms of preventing or alleviating loneliness and isolation – which can have a very adverse impact on people’s mental health. Claire and the whole Tesco Team were absolutely wonderful we can’t thank them enough, added Louise, who also thanked Nant Mawr Court Warden Anita Vale and Julie Evans, Community Development Assistant for helping with the arrangements. "National UK Award for Rhyl regeneration housing scheme"
"Construction partners play Santa in Flintshire"